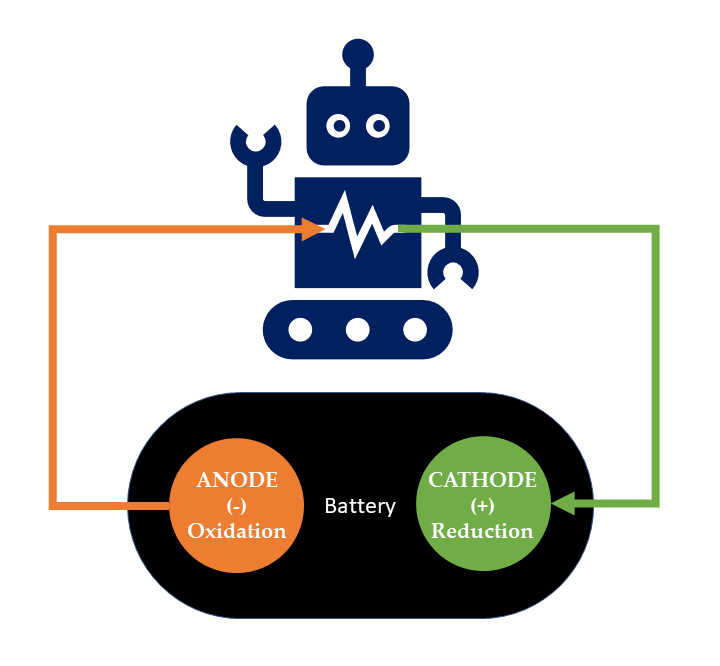 The word anode comes from the Greek ἄνοδος (anodos), meaning ‘ascent’ or ‘the way upward’ , which today refers to the movement of electrons up into the circuit after being released from the electrode material by oxidation. Meanwhile, in a traditional cell, the positive ions resulting from the same oxidation enter into the electrolyte solution. Thus, the anode is the electrode where oxidation occurs . The anode is also called the negative terminal. The word cathode comes from the Greek κάθοδος (kathodos), meaning ‘descent’ or ‘the way downward’ , which today refers to the movement of electrons down from the circuit into the electrode where they facilitate electrochemical reduction of the positive ions in the electrolyte solution at the surface of the cathode. Thus, the cathode is the electrode where reduction occurs . The cathode is also called the positive terminal. Ross, S. Notes and Records of the Royal Society of London 1961, 16, 187–220. McNaught, A.D.; Wilkinson, A.; Jenkins, A.D.; International Union of Pure and Applied Chemistry, IUPAC Compendium of Chemical Terminology, 2nd ed. (the “Gold Book”); Blackwell Scientific Publications: Oxford, 1997. This entry was posted in Science and tagged anode, cathode, electrochemistry, etymology, history, oxidation, reduction. Bookmark the permalink.